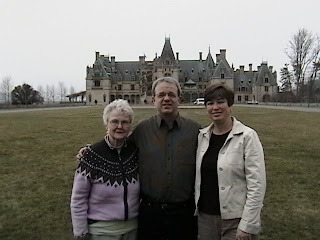 Welcome to our new house, just kidding, but we did get to visit the Biltmore house in Asheville, North Carolina. It is America's largest home. 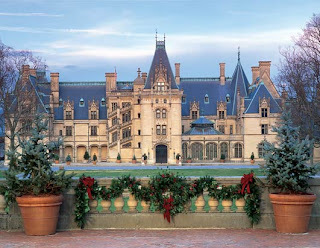 It was built in 1895 by George W. Vanderbilt. He was a bachelor for the first three years that he lived in it. Yeah, one single man lived in a home with 250 rooms; There were 34 bedrooms, 43 bathrooms, and 65 fireplaces. Do you think he had any women wanting to be his bride? Nicolette, Ryan, Gabe and Rachel were there too but didn't want to get out of the warm car for a picture. We were glad Mom could go with us on this fun trip. She really enjoyed the tour of the house especially the part where we pushed her all around in a wheelchair. She even got to go up in the orginal DC elevator. At the time the home was built, few homes had the features of this home: running hot water, indoor sewer systems, walk-in coolers, indoor swimming pool, bowling alley, and electric lighting. 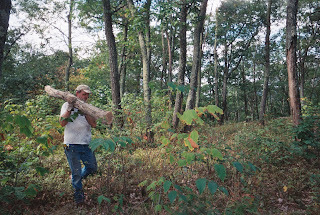 This Fall (2008) we went to the George Washington Forest to get wood to burn this winter. It is now paying off and we are enjoying the cozy warmth of the woodstove. It saves on the bills too. 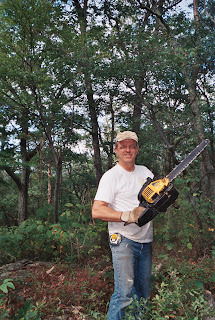 Randal sawed them off into 6 foot logs and then we hauled them home and cut them into smaller pieces. We also enjoyed the time together in the outdoors away from all the traffic. Here is my Paul Bunion. Thank heavens for chain saws. How did they ever do it with just an AX! Loaded and headed home where the work continues. It was a beautiful Fall day. Not too cool and not too hot....Just right!! 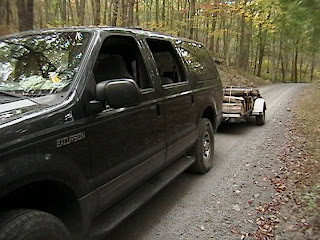 The load doesn't look that big but it was a lot of work and all of the logs were heavy and solid oak. In total, we got 3 trailer loads. The permit was only $20. Well, if you are going to have a flat tire some where you might as well do it with a great view!! And, yes, we really did have a flat tire. I took this picture while Randal put on the spare. 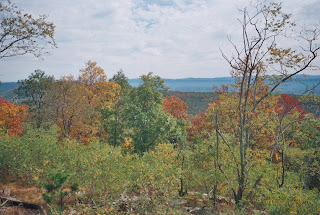 We love the Fall in Virginia. It is really beautiful. 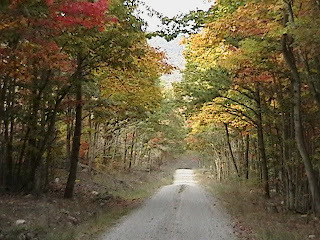 The trees are so thick in the Forest that they make a canopy over the road. The variety of colors and the contrasts really are amazing. 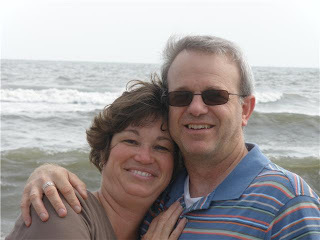 Last Fall we got to keep Gabriel over night while Nicolette and Ryan went to a Rascal Flats concert at Virginia Beach. 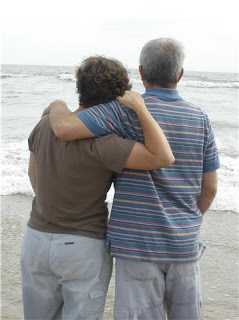 We drove to Virginia Beach the next day with Gabe. 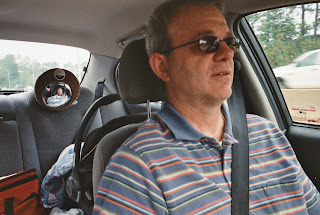 I love this picture of Grandpa driving and you can see Gabe in the mirror sleeping peacefully. He was such a good boy but was glad to see his Mom and Dad again. We love visiting the Ocean. There is something romantic about it. It was too cold to swim so we enjoyed getting our feet wet and watching the waves. Nic and Ryan took Gabe and went on to visit some friends in North Carolina. We went on a loop drive to the Great Dismal Swamp. The water actually looks black and the land around it is like a big sponge. 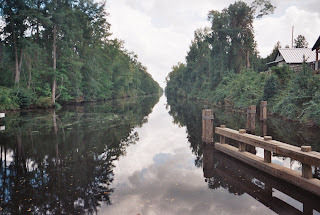 This 22 mile canal was built by slave labor. They worked in mud and water up to their wastes and sometimes necks trying to drain the swamp with buckets. They were motivated by being told that their labor would buy their freedom. However, few of those who lived through the ordeal were able to actually do so. The conditions of the swamp were very harsh. There are stories of alligators and wild beasts, torturous insects, copperheads and cottonmouths. The orginal swap exceeded one million acres. It became a business venture for timber. Cypress and Atlantic white cedar trees grew well in the swamp and became very profitable. 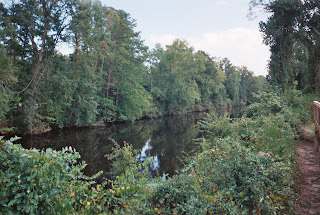 Not only was it a business venture but the dense forests provided refuge to runaway slaves. There were very few spots in the swamp that were not covered by water but the slaves would find them and plant corn and other crops and live off the land. They also survived on wild hogs and fowl. They built huts in back places hidden by bushes. Some of them lived there for 20-30 years. They would rather be free and suffer the harsh condtions of the swamp than the harsh conditions of slavery. Slave owners would hire men to go in to the swamp and find their slaves but few came back out alive. 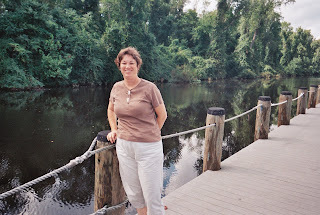 The Great Dismal Swamp was certainly dismal! But oh how interesting! We hoped that the aligators would take to the bait but no takers. Today the swamp has a great Visitor Center and is open to canoes, kayaks, rowboats, and ferryboat tours of the wildlife refuge. Nature lovers and bird watchers come from all over the world. We had a great time.